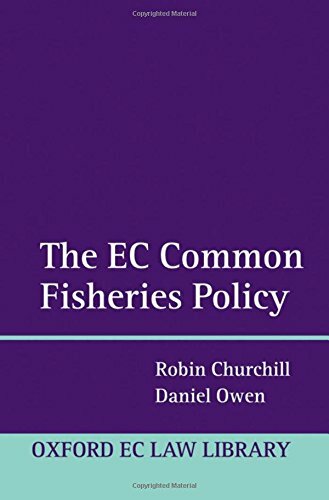 The Common Fisheries Policy (CFP) is one of the longest established and more controversial of the common policies of the EC. It deals principally with the management of fishery resources, relations between the EC and third States in fisheries matters, the marketing of and trade in fishery products, financial assistance to the fisheries sector, and aquaculture. However, the CFP is not just a matter for those with an economic interest in fisheries. It also raises many issues of more general concern, such as the capacity of the EC and its Member States to manage important natural resources sustainably, the impact of fishing on the wider marine environment, and relations between developed and developing States. This book addresses the CFP from a legal perspective. It provides a detailed account of the very large body of EC law comprising the CFP, and draws on the European Commission's associated documents to aid interpretation and add context. As a result, the book will be of value to anyone wanting knowledge of the law of the CFP. Although not addressing the Commission's 2009 Green Paper on reform of the CFP, the book should provide a useful reference point against which to view the reform of parts of the CFP that is anticipated to take place over the next few years.